One of the things Marcos and I have in common is that we are tremendously horrible at gift-giving. No matter how hard we try, it is just not our primary language of love. So when holidays roll around that we feel are especially important, it is usually helpful if we prompt each other. For example, I might say, "Marcos, Mother's Day is coming up, and since it is my first as a mom I would like you to make it very special". The week before Mother's Day this year we went out on the town for a great dinner (with baby in tow, of course), and I was also spoiled with an hour-long massage session that changed my life, or at least my week. For us, that is a great gift. 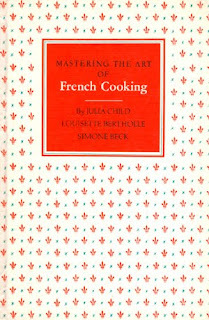 So imagine my surprise when a few days ago this set of books arrived in the mail: Julia Child's two-volume set of Mastering the Art of French Cooking. I had mentioned months ago that I was inspired to dig into this culinary classic, and voilà, there it was in the mailbox! 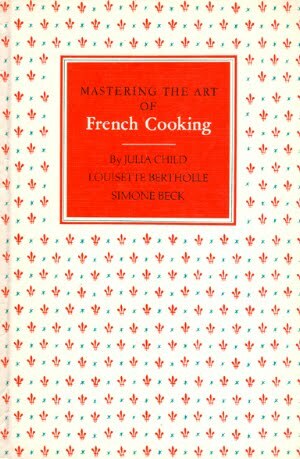 So if anyone is inspired to join me on this adventure, I will be tying on an apron and trying my hand at French cooking. The joining fee is five sticks of butter and a large slab of high quality veal. And if nobody is interested in joining me, I think I will start a foodie blog and post about my adventures with one new recipe each day for a year. what a nice gift. the next book you need is Dona Benta http://www.submarino.com.br/produto/1/221908/dona+benta:+comer+bem she's the Brazilian version of Julia only Brazilian recipes. You'll love her book. serio, vale a pena! I just watched it, and I had the same thought, I am very interested in joining the butter part, but will only attempt the veggie options. perhaps I could do one on that. Best of luck my love! You may share any of your creations with us if you like. =D I don't hate butter. Have fun! While I'm not a huge fan of veal, I do absolutely love butter. Is that enough to count me in?? ?